My Salisbury Steak Meatballs smothered in garlic gravy on top of buttermilk mashed potatoes is just about the dreamiest meal I can imagine. Add the rest of the meatball ingredients over top and blend just until everything is evenly combined, don't over-mix. Use a 1 1/2 inch cookie scoop to portion out the meat and roll into round balls. Set the balls on a baking sheet, you should have approximately 24 meatballs. Bake in the preheated oven for about 20 minutes, or until the meatballs are browned and register 160F inside. Meanwhile make the garlic gravy. Lightly coat the pan of a large skillet (big enough to fit the meatballs) with olive oil and warm over medium heat. Add the garlic and cook, slowly, for about 20 minutes, stirring often. Adjust the heat so that the garlic doesn't burn or brown too quickly. When the garlic is nice and soft and golden, add the sherry and cook until the liquid is reduced. Separate out 1/2 cup of the broth and mix with the cornstarch, set aside. Add the rest of the broth to the pan and stir to combine. Bring up to a simmer, and add the cornstarch mixture to the pan, stirring constantly. When the gravy thickens, season with salt and pepper to taste. You can add a splash more Worcestershire if you like. Add the meatballs to the pan and cook together until they're hot. 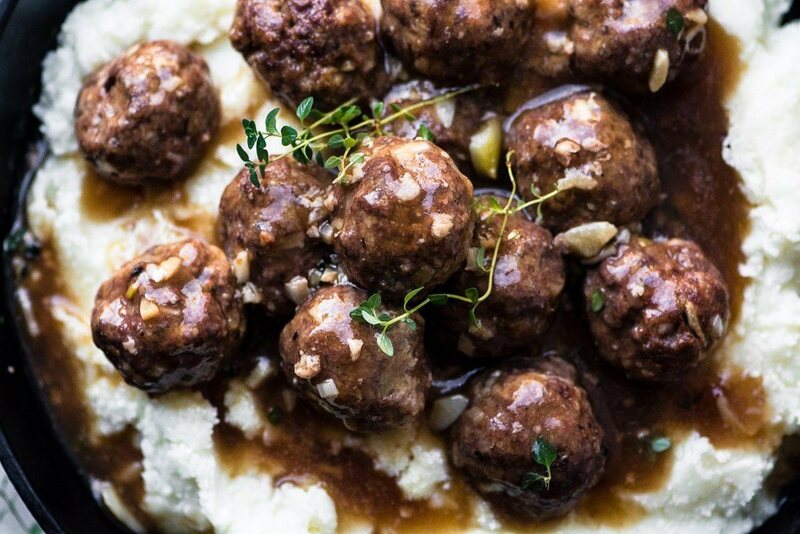 Serve the meatballs and their gravy over buttermilk mashed potatoes, garnished with fresh thyme or parsley.